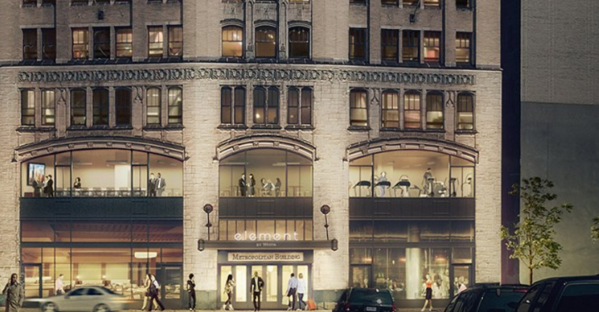 The Element Detroit opened January 21 at the renovated Metropolitan Building, adding an extended-stay hotel in the city’s downtown core. The 110-room hotel is at 33 John R. St., near Grand Circus Park. Its debut comes after a $33 million redevelopment of the 93-year-old, 14-story Metropolitan Building, which sat vacant for 40 years. The team behind the renewal is Metropolitan Hotel Partners, a joint venture between Detroit-based Roxbury Group and The Means Group Inc. The Element Detroit hotel describes its design as “nature-inspired.” Like other Element-branded hotels, it an environmentally friendly focus: artwork made from repurposed materials, low-flow water systems, eco-conscious products and free-to-rent bicycles for guests. Standard rooms have mini-fridges and microwaves, while studios and one-bedroom suites have full refrigerators, dishwashers and cooktops. The developer expects a rooftop bar, the Monarch Club, to open sometime soon. Specifics on two other dining and/or drinking venues planned for the building are yet to be revealed. There will be 7,000 square feet of retail and dining space, in addition to the rooftop lounge. It’s Detroit’s only extended-stay hotel and also is the first Element hotel in Michigan. The Element brand belonged to Starwood Hotels & Resorts Worldwide, Inc. until Starwood was acquired by Maryland-based Marriott International, Inc.